Team Quacker Wackers headed north this past weekend to try to shoot some birds in the Western Upper Peninsula. We weren’t disappointed as several flights of wigeon and ring-necked ducks parachuted out of the sky to give us some good shooting. We totaled 22 ducks and managed to take seven different species! The different species included wigeon, ring-necked ducks, blue-winged teal, mallards, black ducks, northern shoveler, and wood ducks. We had six members in the camp and harvested the birds in a variety of methods: over a traditional decoy spread, jump-shooting potholes, and layout shooting (without decoys). We had a great time with an awesome group and incredible food – including Turkish pickles! Pete Wyckoff will be headed north in early October for the Quacker Wacker annual Duck Camp. ALthough the location is secret, I will be sure to post the results from our camp. We hunt grouse and woodcock for a day and ducks for 2 days. Camp should be exciting this year as my family will be stopping by to check out how we are doing and we will have 6 hunters in camp. Belle and Gordon Setter “Sparty” will be doing the lions share of the bird locating and retreiving for the group. The cool fall should bring some migratory birds down for camp and we are excited at the possibility of a hunt focused around mallards, wood ducks, black ducks and ring-necked ducks. Check back in mid October for an update on how Duck Camp goes. We are fully booked for this year’s layout hunts, but it’s not too early to inquire about next year! 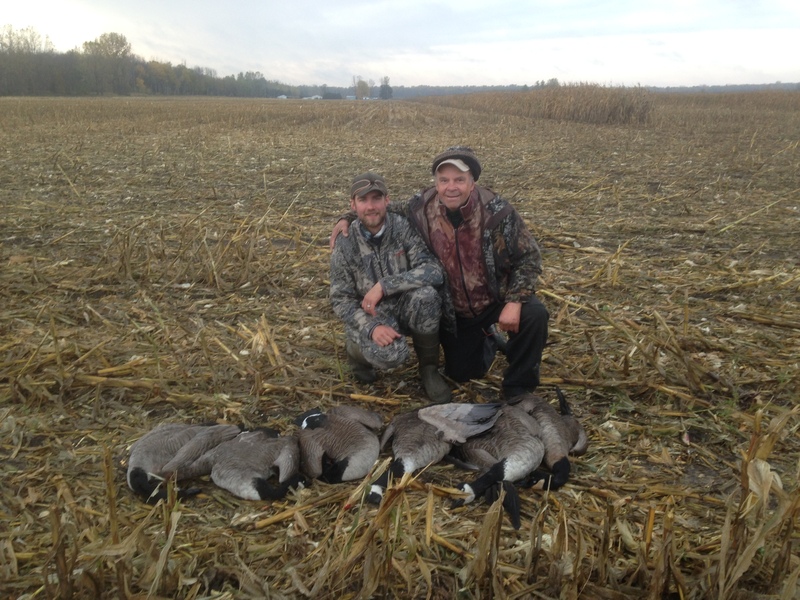 A little scouting and conversation with a landowner provided a prime early season Canada Goose Hunt for Team Quacker Wackers. Pete Wyckoff assembled a group of friends for a hunt in a cattle pasture. Permission was granted by the landowner on Thursday prior to the Sunday hunt. A brief introduction and explanation of safety consideration and an offer of some of the game turned into a great hunting opportunity. The property is currently under pasture for production of beef cattle and the geese had been spending the middle of each day relaxing on the pond and picking grass in the pasture. Several days of scouting revealed a few teal using the pond and approximately 200 Canada Geese arriving mid-morning and staying for the majority of the day. We got in early and set up our blind with about 3 dozen goose decoys and a handful of teal decoys. We watched geese fly most of the morning and had mallards, wood ducks, and wigeon work the decoys in the water. We also had a hen hooded merganser that decoyed three different times. Geese started to arrive around 10:30 am and we were more than ready for them. Due to narrow shooting lanes, the first flock landed unscathed and walked around the pasture in areas we couldn’t shoot. The second group landed with the first, but chose to walk right into the decoy spread. We let the lady of the group take the first shot as they took off before the rest of the group unleashed. The flock numbered about 15 birds and only 4 left the field that morning. We scratched out a few more and ended the day with 15 geese all together. It was a great early season hunt and a good tune-up for Belle who already had 8 teal retrieves under her belt this season. Scouting for birds is the key to getting good spots and a friendly conversation with a landowner can lead to some really good hunts. My relationship with the landowner is continuing to improve and develop. Periodic contact with the landowners is essential to securing hunting opportunities and maintaining hunting opportunities. I see this landowner at least once a month in order to continue the relationship. My first encounter with him was 4 years ago in search of a turkey hunting property. He declined to let me hunt that year, but has decided that letting me on his property isn’t such a bad thing. He has refused the offer for the wild game that I take from his property and gets more enjoyment out of hearing my stories than any kind of physical gift can provide. Do your work early and often and it will pay dividends. Stick to your ground rules and make them clear before each hunt so that your group doesn’t abuse the opportunity and you can realize high quality hunts day in and day out. Captain Christian and Peter Wyckoff traveled to the west side of Saginaw Bay for opening Day of the Experimental Teal Season in Michigan. We scouted on Sunday night and saw very few teal flying around the marsh. Monday morning revealed 8 other parties within view. It was a beautiful warm morning and Belle was enjoying the early hunt hanging in the marsh beside us. As shooting time came and went, we decoyed numerous flocks of mallards and a few wood ducks, but no teal were seen in the marsh until after 8:30 am. Making sure we identified the teal before shooting, we passed on the first two singles and were rewarded with more birds later. The highlight of the morning was a flock of green-winged teal that pin-wheeled around us from behind and made a low and slow pass through the decoys. 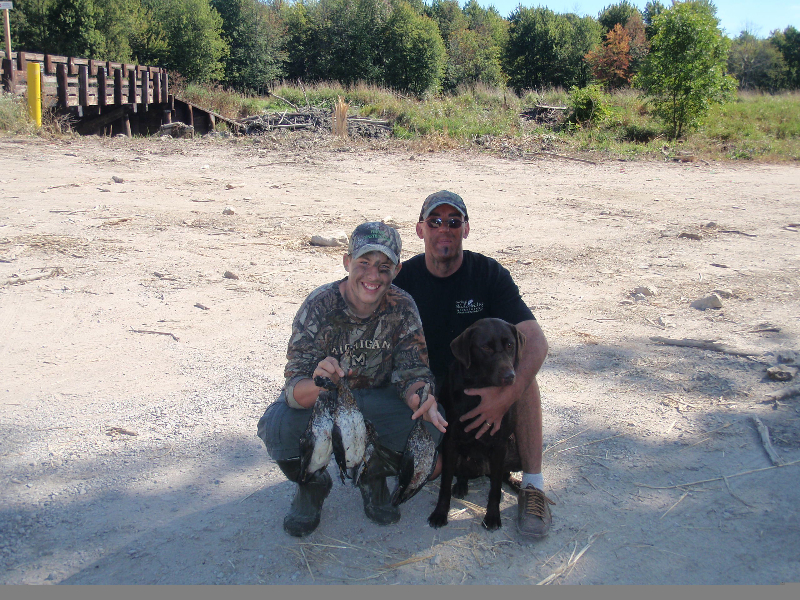 For the hunt, we bagged 5 GWT and 3 BWT and couldn’t have enjoyed a more scenic hunt. Pictures will follow soon. 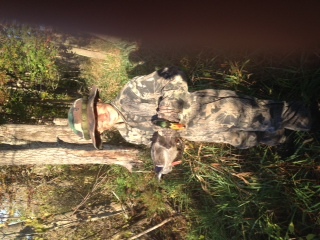 11 year old Ramsey is our newest Team Quacker Wacker member (not youngest ask Pete about that), Ramsey killed 4 birds including this drake mallard opening weekend. The thing that made me proudest is how safe he is in the field. I can’t wait to get him on the Bay in the layout boat! Hunted opening morning with my Dad and college friend Chris. Chris had never duck hunted before so I walked him through the process of buying a license and duck stamp. The night before the opener we went through the entire regulation book and talked about different bag limits for different species. It was fun to see the excitement in the new Quacker Wackers eyes. 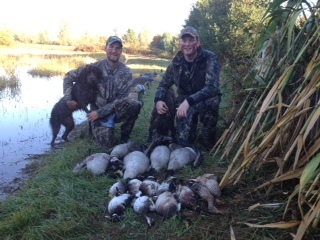 Opening morning was picture perfect with woodies and mallards landing in the decoys before shooting time. Once shooting time arrived it was quick and steady action as wood ducks buzzed by and mallards swung in. Once things settled down and the dogs retrieved the birds we hardly had time to sit down when the first flock of geese arrived. Chris couldn’t believe how big they looked! Needless to say we killed a limit of geese in the first two flocks and called it a day. We spent the next few hours cleaning all the birds–all part of the hunt. I told Chris how spoiled he is and how I need to take him on a late season hunt to give him another perspective. He is hooked. 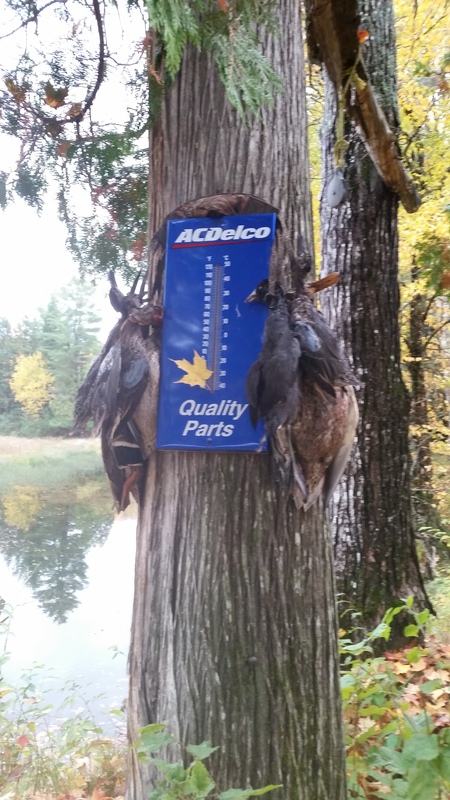 Team Quacker Wackers got permission to hunt a cut corn field in the northern lower peninsula last weekend and it turned out to be a very productive hunt! We scouted the field the night before and located exactly where the geese wanted to be and set up the following morning. We were rewarded when the first flock dropped right into the decoys. We took two from the first flock and eagerly awaited the next flock. It didn’t take long before a second flock of five birds cupped up into the decoys. With their feet down at 20 yards, we let them have it and knocked down four birds in short order. It was a short hunt and we had five more flocks come in while we packed up, but it was extraordinarily fun to be able to shoot those big birds with their feet down in the decoys. Team Quacker Wackers ventured to Saginaw Bay for a cast and blast weekend. The weekend went well with ten ducks per day and a nice package of about 15 perch from the weekend. We shot Lesser Scaup, Greater Scaup, Redheads, Buffleheads, Ruddy Ducks, and Green-winged Teal. It was nice to hunt some shallow vegetated flats and be covered up with birds for most of the day. The tender boat enjoyed some good perch fishing. Just as the perch fishing got good, the tender had to pick up birds from the layout! 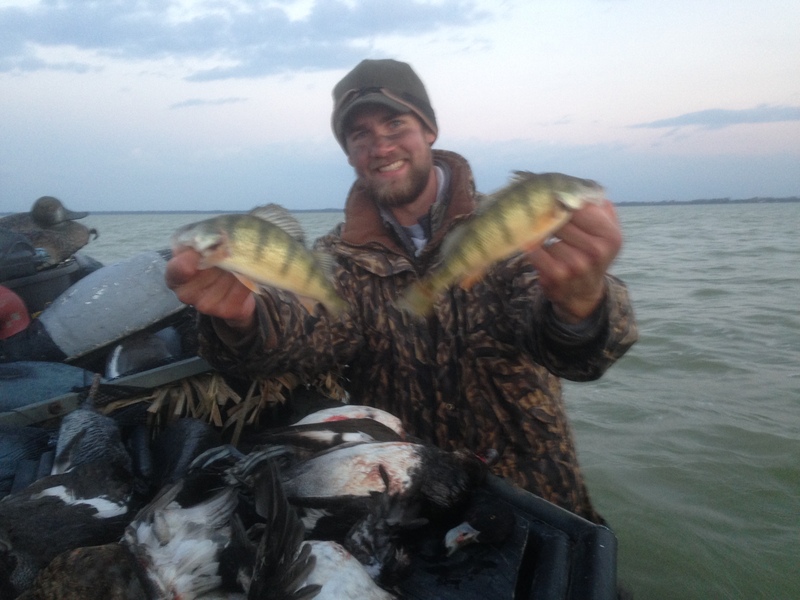 Several perch exceeding 11 inches were picked up! The days were made even better with a hot breakfast of sausage, eggs and toast! We’ll be headed back out on October 31 and still have that date open. Please call Captain Chris if you are interested in booking a hunt! The Quacker Wacker Team is splitting up to hunt different areas of Michigan for the Southern Lower Peninsula Duck Opener. Pete Wyckoff will be headed to Saginaw Bay to hunt divers and puddle ducks. We’ll be headed out of the thumb trying to shoot a few birds. Second day should be exciting with Pete’s 3 year old son observing the hunt. Captain Chris Blough will be hunting small water in southwest Michigan for puddle ducks with a focus on mallards and wood ducks. Good numbers of birds have been located in the marshes he hunts and should provide some good shooting for the hunting party! Check back in after the opener for updates. We are still booking hunts for October 17-20, 31 and November 1-3. 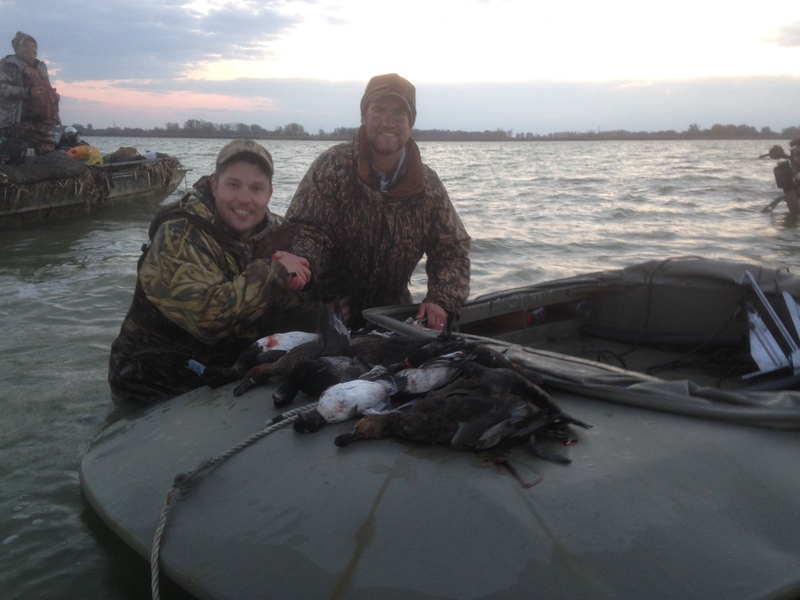 Book now and experience Saginaw Bay Diver and Sea Duck hunting from a two-man layout boat!